Gitzo has introduced new Center Ball Heads, a lineup composed of three different-sized models aimed at professionals and advanced amateur photographers. The new lineup is composed of the GH1382TQD, the GH1382QD, and the GH3382QD, all of which use a tungsten disulfide coating for smooth movements and, in the case of the 'QD' models, a friction control knob. Other features include slim designs, matte grey plated steel top casings, support for most Arca-Swiss styled plates, independent pan lock, and hardened metal components both around and under the ball. 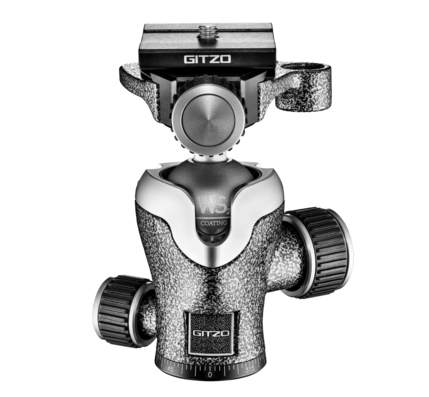 The highest-end of the three models, the GH3382QD, is ideal for Gitzo's Series 2 and 3 Mountaineer tripods, according to the company. The 'Traveler' GH1382TQD model is available now for £264.95/$319.99 and the GH1382QD model is available now for £299.95/$369.99. The GH3382QD model is priced at £379.95, and will be launching in mid-November; US pricing and availability for this model isn’t available now. Gitzo, pioneer in developing some of the most advanced and revolutionary technologies for camera accessories and supports, is proud to introduce a completely new range of Center Ball Heads, representing the state-of-the-art in the heads’ field and focusing on ultimate smoothness and precision. The Center Ball Heads are dedicated to pros and advanced amateur photographers and are engineered and developed to be the ideal complements to Gitzo’s top of the range tripods. The new heads are available in three sizes ideal for Gitzo’s Traveler and Mountaineer tripods. The new Center Ball Heads are coated with tungsten disulphide - one of the smoothest materials around. With an extremely efficient locking mechanism and the use of hard metal components under and around the ball, this mechanism provides comfortable friction onto the ball meaning it can be locked with minimal effort while avoiding unwanted deforming or drifting. All three models feature an independent pan lock, making it possible to take panoramic photos or make horizontal adjustments for perfect framing. Friction control is also available in the GH1382QD and GH3382QD. Located in the ball lock knob it functions independently allowing the ball lock to have a quick locking without sacrificing movement and safety. The plate is locked with a screw-knob, which makes the system compact, light, and intuitive, while being flexible to accept most Arca-Swiss style plates. The new Center Ball Heads have slim, curved forms and are aesthetically outstanding with a triangular accent, and matte grey plated steel top casings. Dimensions and colourings are designed to match perfectly with Gitzo’s Traveler and Mountaineer Tripods. Yay, more $300-400 Arca ballheads. A hundred of them out there now? Two? Three? Bought a Sirui ball-head for $100 shortly after DPR's review of them and have been very satisfied. It was a substantial upgrade to my similarly priced Manfrotto head. Just more underwhelming garbage put out by Gitzo. Had a Gitzo head get damaged (piece chipped off lever clamp) from a accidental fall. Sent it to Gitzo for repair estimate. Head still worked fine but the clamp was sharp where it broke. Gitzo returned the repair “estimate” for $500, literally $200 more than the retail price of head. Had a Gitzo Basalt tripod with extension section and there’s a small plastic piece that keeps the extension section from spinning. Sent it in and they wanted $400 to repair a simple piece of plastic on a $400 tripod. NEVER will I purchase anything with their name on it again. The parts department at the USA distributor is terrible. Un-returned phone calls, messed up order, messed up return, no on-line ordering of parts. I too will buy a different brand next time around. The tripod is fine, but I cant tolerate the service. Rrs makes the best tripid today.so does flm and feisol. Depends really on how much you want to spend! The Berlebach Mini tripod is the best small tripod I've used, in short: superb, at a very friendly price (and low weight), while my own bigger, even more rugged, tripods are all Gitzo! Bought my first Gitzo in the 70's! Sold my first one a couple of years ago, but it is still in use! Hi Tord, still got and use my Gitzo tripod that I bought in the mid 1990's now Gitzo is made by a Chinese company Vintek. Love the Gitzo I purchased in 1984. Still using it today as my main tripod. Same here. China is cheaper, but while the Nikons and Canons come and go, your tripod is still current. Hey BattleBrat, how long have you had your Slik? I'm really loving my Slik 614CF. (discontinued a while ago, I had to hunt one down on Ebay) It's lighter than any Gitzo yet taller, but I've only owned it for a short while and I fear it may not be as rugged and indestructible as a Gitzo. The 700DX just arrived a week ago, that is a LOT of tripod for $130, and my Sprint Pro II with the three way head just arrived. But i had a. 500HD for years, loved it! Oh okay, I have a 700DX and a Sprint Pro II as well, and the 700DX especially is clearly going to last forever. The lighter weight carbon fiber models are the ones I'm interested in hearing long-term reports for. I have a Gitzo 1228 (their first CF Mountaineer model from about 15 years ago) and a Slik 614CF for lighter work (hiking and kayaking use). I've had the Slik for about two years and it's been fine though not used all the time. Good little tripod and still in good shape. The only 'fault' has been that the thread that holds the two sections of the centre-post together became locked through factory tightening and lack of use. (It allows you to remove the bottom of the post for very low work). Once I got it undone, some grease and hand tightening fixed the issue. I think the 614 CF has been replaced by the 634CF. Thanks Rod! Yeah I treat my 614 CF with care, I have plenty of other "beater" tripods for daily use, and I only use the 614 CF on backpacking trips and other important travels. The main reason I'm concerned is nothing to do with the legs or the center column, (my removable center column is stuck too) ...it's the leg angle adjustment locks. When I hunted down this tripod on Ebay, (I wanted the 614 instead of the 634 because it was just slightly lighter) ...someone had just forced the leg angle to break past its usual position, and I had to pay to get the main center piece replaced. No specs, so we don't know size and weights yet. I can't help thinking that they just look more complicated and lumpier than a simple ball head with a classic top plate and thread like the Gitzo 1177M. It you're traveling, they're neater and lighter to pack around. I suppose if I was working professionally on some kind of assignment a QR system might suit, but for real travel, minimalism rules. I hate having a plate permanently mounted to the base of my camera. Does this replace the GH227114962833TQDGRPP II? If you are starting out fresh with a carbon fiber tripod and ball head would you get Really Right Stuff or Gitzo or 3 legged Thing? I do like the Arca Swiss ability, so I can keep the lens centered when I go for a vertical shot..
1) RRS because they offer complete systems, offer the highest quality, and made in the USA. Though pricey, I'd much prefer to give my money to them than throw it away on over priced Italian/French/English made products where quality has become iffy e.g. Gitzo still uses glue to join some parts. I was highly disappointed when parts of my top of the line Gitzo came unglued after only 3 yrs of use. RRS uses threaded connections or inset screws on all critical connections. 2) If I had to throw money overseas on tripods, then it would be Chinese made Benro or Sirui. Great value for surprisingly high quality which have exceeded Gitzo and Manfrotto in some ways. e.g. like RRS, Benro and Sirui use threaded connections or inset screws on all critical connections. ps. Re 3 Legged Thing, I don't know much about. Maybe they are a good value. My experience is based on ownership of 3 Gitzos, 1 Manfrotto, 3 RRS, 2 Benros and a Sirui. I went for RRS as my first ballhead and was always 100% happy with it. @Mako109: I too had a Gitzo carbon fiber come apart where the legs attach to the platform. A bit of Gorilla Glue fixed it neatly. BUT, I was really annoyed that this expensive tripod required a repair like that. My next CF tripod will be a RRS, and I've been a Gitzo fan for over 25 years. The problem is they don't claim Arca-Swiss compatibilty, just that most "Arca-Swiss style" plates may work. Misuse of the claims to AS compatibilty is common across brands yet could so easily be avoided by making products that really are Arca-Swiss compatible rather than making "improvements" to the AS standard that may or may not work with some other maker's "improvement" to their counterpart. Yes, that's my experience with other brands too; it's usually easy to modify (ie undo the "improvements") to get a proper AS fit but as you say, it's a shame the manufacturers don't do AS compatibility properly in the first place. I was once refused to board my flight on the basis that the ballhead I was carrying in my hand luggage is a weapon. In case you're interested, the airport was Genova, Italy. I was once refused boarding a flight on for a climbing caribiner that was attached to my camera bag. I wanted to take my belt off and wrap it around my fist and with all my force punch the guy in the face. Take a 300 lb professional weight lifter who has two hands that can punch through a wall, will that refuse him boarding with his fists? That's nothing...Security at Shannon Airport, Ireland wanted to keep my rocket blower as it looked like a hand grenade. i own several Gitzo heads, but i lost interest in the brand once they obstructed the clamps from being removed and replaced with true arca-swiss clamps. since then i became introduced to some very well made Chinese made arca-swiss alternatives. They use Locktite on the threads and it took some heat and muscle and I removed my Gitzo head camera platforms and installed RRS clamps.